Having spent three months traveling throughout India and having read the novel Q & A (Vikas Swarup), the novel which Slumdog Millionaire is loosely based on, I was quite thrilled to realize that Bollywood was making its way to Hollywood. The award winning film is packed full of the essential elements that birth a hit - a captivating plot, moving lead characters, and whole plethora of heart wrenching circumstances designed to inspire. 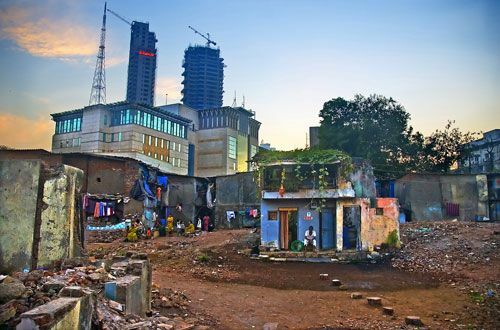 The slums of Mumbai drew my interest to the film, though: not the flashy cinematography or the catchy soundtrack. The grim realities of the slum life in Mumbai are astonishing. An estimated 6 million people, or 55% of the population, live within slums scattered throughout the city. Despite housing the majority of the population, they are crammed on only 8% of the city’s land. To put this in real terms imagine your slightly cramped but comfy dorm room. Now, imagine you, your siblings, your parents, a small cooking area, and a small set-up that may earn your family a meagre income all in that space. Feeling cramped? My experience of Mumbai was limited to the train station, airport, one 'interesting' hotel, and the books I’ve read. My complete ignorance, pulling away from the train station in Mumbai, still strikes me. I was completely unaware that less than 1 km away existed, what is now one of the most notable slums in the world, Dharvai. Constructed atop a former mangrove forest/swap area, Dharvai is located smack-dab between the two major train stations in Mumbia and is home to nearly 1 million people. These 1 million people are faced with some of the harshest living conditions in the world. Substandard medical facilities and inadequate sanitation infrastructure have spelt disaster for countless who have fallen victim to slum life. Slum dwellers are also faced with a shortage of primary education, potable drinking water, the threat of man made and natural disasters, high levels of child labour, thriving organ harvesting markets...you get the picture. Mike Davis, author of 'Planet of Slums' lays out some revealing illustrations pertaining to slum life in Mumbai. Firstly, a study of 22 slums throughout Mumbai revealed that only 9 were equipped latrine facilities. 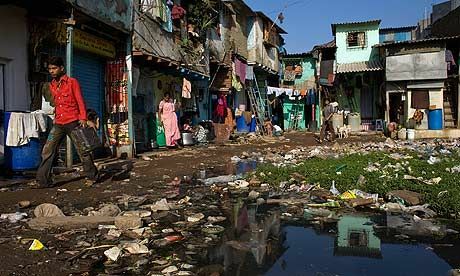 The majority of slum inhabitants are forced to defecate in public. The women live in a society where it is not widely acceptable for them to pop a squat and relieve themselves. So how to they cope? Only between the hours of 4 and 5 am, and sometimes in the late evening, preferably after 11pm. This makes them an easy target for hungry wild dogs and creepy men. Slums often encroach not only on essential agriculture land but also on protected nature reserves. The disappearance of agriculture land, as a result of newly constructed slums, has resulted in serious food security issues. This alone should cause feverous public outcry in times when food security is a major topic of concern. One particular slum in Mumbai has encroached so deeply into a protected park that people are being eaten by leopards. Eaten by freakin leopards. 'Are baap re' [oh my god in Hindi]. What would you do if people in your neighbourhood were regularly being eaten by leopards? !